I had heard a lot about painters from her time, but never about her. I learned that she in her own time had been highly respected as an artist, but had been forgotten after her death. It were female art historicans who found her again. I got in touch with Larry who created a website about Artemisia. You can find a lot of information and pictures on the site. There’s been written a lot about her, both art books and novels. I’ve read the novels written by Susann Vreeland and Alexandra Lapierre. Both are well-written and bring her to life. Of course there’s always a bit fiction in novels. Still it’s interesting reading. 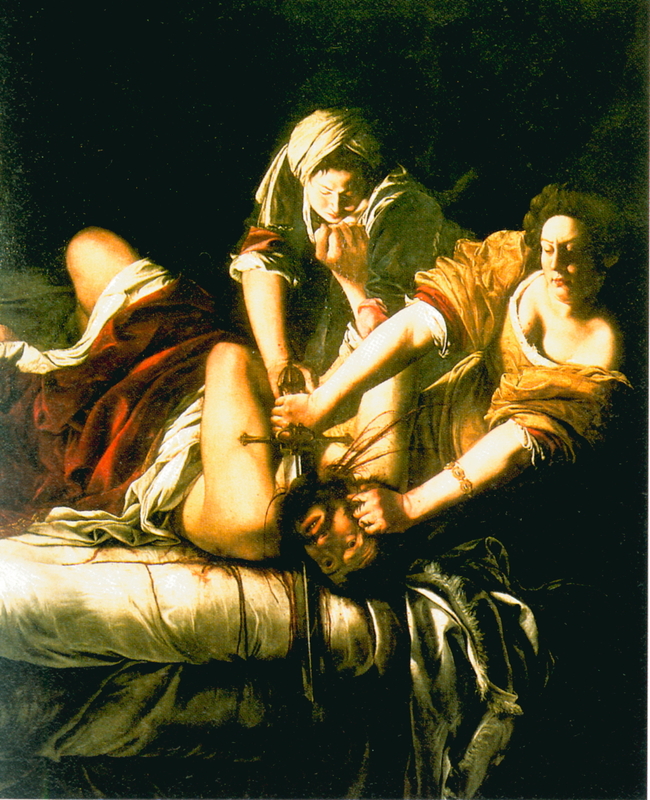 So who was Artemisia Gentileschi? She was one of the rare female painters of her time. She was born in Rome to the painter Orazio Lomi Gentileschi (1563-1639) and his wife Prudentia Montone. Her father teached her to become painter and she became, as her subject in Judith and Maidservant with the Head of Holofernes, a heroine for women to emulate. Orazio was at least as famous as Artemisia in his own time. He was one of the earliest followers of Caravaggio. He was over forty when he transformed himself from an undistinguished painter into an artist of astonishing originality and genius. Artemisia became her father’s outstanding pupil. Motherless at the age of twelve, she was mostly confined to their house, which also served as her father’s studio. Artemisia married a Florentine painter, Pierantonio Stiattesi, in 1612. It was a marriage of convenience and lasted ten years (Pierantonio abandoned her in 1622/23). They had four children (only one, Prudenza, lived to adulthood; like her mother, she painted). The marriage provided Artemisia the social acceptability on which to construct her professional career. Artemisia’s talent carried her from Rome to Florence (where she painted for Cosimo II de’Medici as well as for his wife Maria Maddalena), to Rome, Venice, Naples, and London. She died in Naples in 1652, having achieved a European reputation.